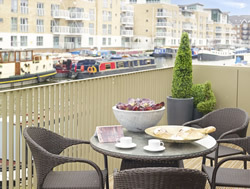 Since its launch in March 2013, Brentford Lock West, an exciting new collection of contemporary homes situated along the banks of the Grand Union Canal in Brentford, has proved to be a popular development, with over 90% of the first release of homes in The Halyards having been sold. The second phase is due to launch in mid-November, when there will be a further opportunity to reserve off-plan. The homes, which are being delivered by leading waterside developer ISIS Waterside Regeneration, will offer buyers a unique opportunity to secure a new, highly specified home, while benefiting from a host of community features and green initiatives. Brentford Lock West will ultimately deliver 520 residential homes and aims to create a thriving new waterside community for this vibrant area of West London. The five year project is expected to give a boost to Brentford by providing much needed affordable housing, community spaces and commercial buildings – all of which will generate jobs and investment in the local area. Stretching across an 11-acre site, the development is being sensitively landscaped to create sociable shared areas and allotments that the whole community can enjoy. Because the waterfront is such a major feature, improvements are underway to increase the number of moorings and widen the towpath to capitalise on the leafy and tranquil charm of the canal. The site will also host a new watersports hub with facilities including boat storage and a floating pontoon. Buyers looking to purchase in this up and coming area of West London are welcome to visit the Sales and Marketing Suite, where the last few remaining apartments in The Halyards are currently being sold. These two and three bedroom apartments have proved particularly popular with downsizers and local families, who have been impressed with the abundance of indoor and outdoor space, with smart terraces or balconies offering waterside views. 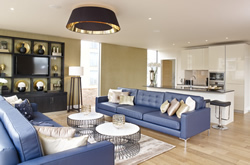 The last few available apartments are currently priced between £499,950 and £619,950. Buyers looking either side of this price range are advised to register their interest for the second phase of the development – The Arbor. The Arbor is a stunning collection of one, two and three bedroom apartments, duplexes and townhouses and off-plan reservations will be available from the middle of November. 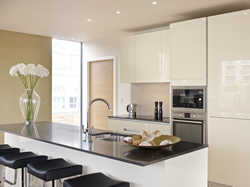 Much like the first phase of the development, The Arbor will attract a mix of buyers, including young professionals, downsizers, families and investors – all of whom will be impressed by the high specifications and standard of internal finish, cleverly designed layouts, generous living space and waterside aspect. Prices start from £264,950.